2 or more: $30.06 ea. At Today’s Concept, we provide efficient solutions for the modern home. 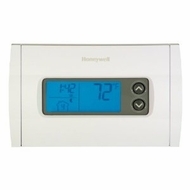 This Honeywell RTH2310B thermostat is no exception. With a 5-2 day programmable heating and cooling schedule and basic buttons, Honeywell RTH2310B thermostat operation couldn’t be simpler. Within minutes, you’ll have daily temperature settings programmed onto your Honeywell RTH2310B thermostat. This Energy Star-rated model from Today’s Concept can be installed in under 15 minutes.